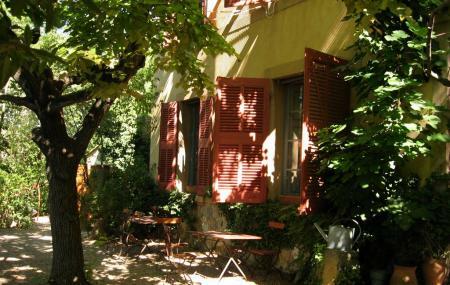 Atelier Cezanne is located on the hills above Aix-en-Provence and is dedicated to the life and work of the famous Provencal painter better known as Atelier Cezanne. The country house was also the studio between 1902 and 1906. The house is surrounded with a blooming garden and the interiors exhibit the artist’s personal belongings as well as spots where his masterpieces like Les Grandes Baigneuses (The Large Bathers) and La Femme a la Cafetiere (The Woman with the Coffee Pot) were created. Objects that were the props of some of his famous paintings are also displayed in the house-museum. There are also video screenings of atmospheric films on summer evenings. Guided tours in English are available and last tour starts one hour prior to closing time. Advance booking is recommended for individuals. Advance booking is compulsory for group visits. Children have discount in entry fee. How popular is Atelier Cezanne? People normally club together Hotel De Gallifet and Fondation Vasarely while planning their visit to Atelier Cezanne. The workshop itself is just a room. You will have a information sheet in the language of your preference. It's not a traditional museum in a sense that your visit is simply to get a better sense of the painter. I really suggest getting the audio guide if you want to learn more about Cezanne and his work. We rarely see a past great painter studio having so many original artifacts of his painting life. Alo visit the park 1 km north where Cezanne was going to paint often + nice view of months Saint Césaire. It's not the must-see we were led to believe. The garden is pleasant, but it's a hike from the old town. Unless you are a huge fan of Cezanne, skip the tour. You can still watch the movie for no cost and wander the garden which has tables and chairs, also at no cost. The more intrepid visitor will take the trail to Zola's dam instead, where Cezanne's paintings can be recognized. If this review was helpful, please click Like! Picasso liked him. I can like him. Cezanne shop was good to preserve. Had seen lots of recommendations to go here. I wouldn’t recommend it unless you were a fan of Cezanne. It was only one room and cost more than we thought was reasonable for it. If you’re a fan of his, then I think it would be a very cool thing to see the studio and learn about the space he created. If you aren’t, it’s not worth it to pay to get in. If you’re hoping to see some of his art work, then this is not for you either. If you are walking from the centre of Aix near the market, know that it’s quite a bit of uphill walking, which I don’t normally have a problem with, but we went in August in the blistering heat so I wish I would have known that beforehand.